At the Auckland Zoo in New Zealand you can find a Tuatara which is an ancient reptile in danger of becoming extinct. The Tuatara is an ancient reptile found only in New Zealand and is the last remaining member of the ancient group of reptiles. This particular Tuatara resides at the Auckland Zoo on the North Island of New Zealand and is perfectly safe in its habitat as this is a reptile that is very close to becoming extinct. The Tuatara is the only survivor of different reptile species that roamed the earth at the same time as the dinosaurs. His relatives died out about 60 million years ago and that is why this ancient reptile is sometimes referred to as a "living fossil". There are approximately 50,000 of this ancient reptile living in the wild on Stephen's Island in the Malborough Sounds in New Zealand and a few more that live on the Trios Group of Islands. The Tuatara has such a slow breeding cycle that it has not been able to keep up with the death rate caused by predators and people. 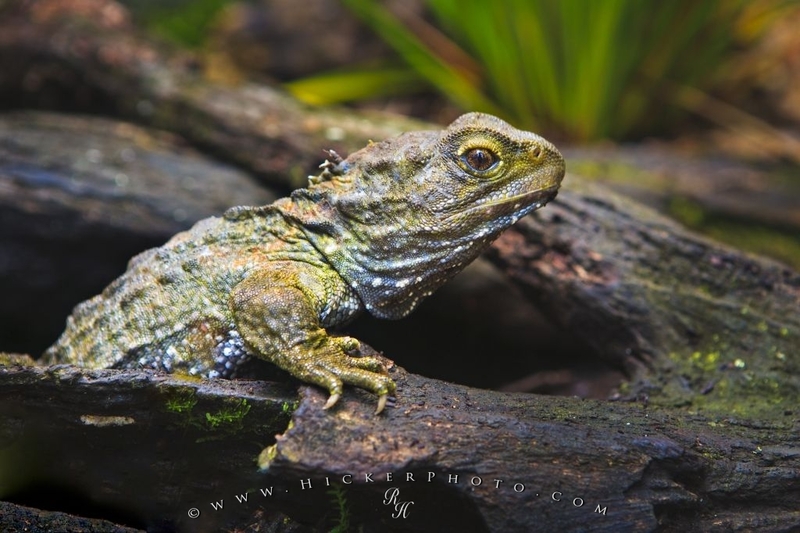 Photo of an ancient reptile known as the Tuatara at the Auckland Zoo in New Zealand. I photographed this photo with the digital SLR camera model Canon EOS-1Ds Mark II, aperture of f/4.5, exposure time of 1/30 sec. on ISO 200, as always I used a original Canon Lens, the focus lenght for this picture was 70mm.